Thanks to Plasma Captain for the box images! The World Bombers have embarked on a rampage, causing havok across the globe! Bomberman travels the Earth putting a stop to their villainy, discovering that they're all being brainwashed. Who could be behind this heinous scheme? 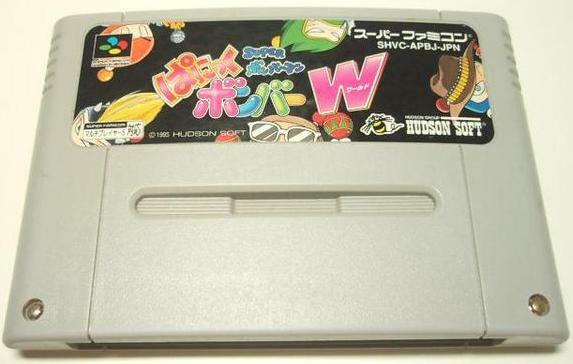 The second Panic Bomber for home consoles, this brings the line-matching, bomb-detonating, falling-block action to the Super Nintendo, with a brand new presentation. Alongside its new graphic assets, it features a proper Story Mode this time around, with trash-talking foes both new and old! 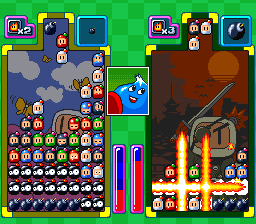 More importantly, this introduces the Dokuro (Skull) Mode - this replaces the garbage blocks with soft blocks, which may reveal a power-up for yourself or an ailment for your opponent when destroyed! Futabasha published a guidebook for this game. 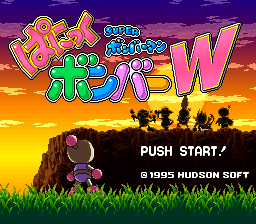 It is also referenced in the Super Bomberman Complete Encyclopedia, Bomberman Bakuretsu Great Book and Bomberman Maniax.